The New Indicator newspaper traces its origins to the first campus newspaper at the University of California, San Diego (UCSD). Although starting life as the official campus newspaper in 1965, within a few years it became a diverse, non-sectarian left radical news collective, serving the UCSD community and beyond. The last print edition was published in 2003. Switching to an online format allows us to dodge the high costs of keeping a print newspaper alive. For many years we also published The Disorientation Manual. To see one of the most recent editions, go to Disorientation Manual . If you are interested in helping us to produce a new edition, please contact us at info@newindicator.org. Many of our back issues are digitized and available through the UCSD Library Special Collections. We published under a number of different names before we settled in on New Indicator, in 1976. Click on the titles to see some back issues. Many more back issues are not yet included in this digitized online collection, but may be viewed at Special Collections. Most have been recorded onto microfiche. Hard copies are also housed there. Many of our back issues are also housed at the Wisconsin Historical Society’s vast collection of newspapers. Browse at newspapers. 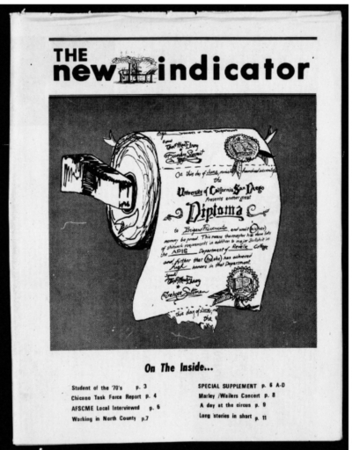 An article on the early history of the paper can be found at pages 8 and 9 of the October 1976 edition of the New Indicator. We invite you to help us make new history. Send us your events, news, commentary articles about UCSD, and about the world it’s a part of. Please contact us at info@newindicator.org. Joe, Emma, Rosa, Lucy, Elizabeth, Peter, Mikhail, Alexandra, Nestor, Abbie, Cohn, Emiliano, Patrice, Herbert, and Noam. The New Indicator used to be recognized as an official campus newspaper of UCSD. We haven’t asked for that status for many years now. The views expressed in the New Indicator do not represent those of the UC Regents, the UC President or the UCSD Chancellor. It makes us cringe to think of them agreeing with us about much. The New Indicator is a collectively produced university-community newspaper. Articles and letters are welcomed. As a non-sectarian newspaper, the New Indicator publishes articles from groups/individuals with different views and positions on issues. Accordingly, articles printed with a byline do not necessarily represent the views and positions of the New Indicator Collective and all collective members are not necessarily in agreement with the positions expressed. Articles published without a byline do represent the views and positions of the New Indicator Collective. All material published is copyright by the New Indicator Collective and may not be republished for profit without permission. Permission for republication for educational and nonprofit use is granted and encouraged. 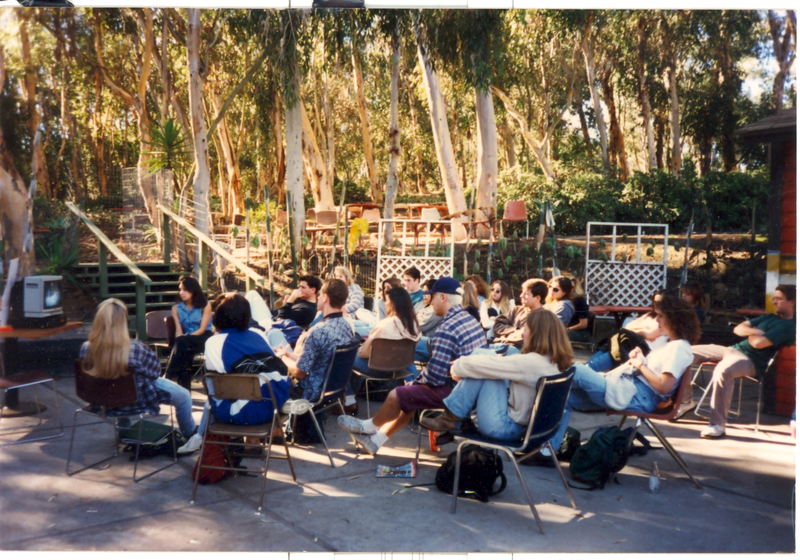 One of UCSD Communications Professor DeeDee Halleck’s classes taught at the Che Cafe. Professor Halleck is now emerita and is still a Che Cafe supporter. Indian Voices would like to be supportive and involved with your publication. New Indicator Collective – newindicator.org welcomes your collaboration and participation. Hello. I’m trying to find a comic book entitled “Resistance Comix” that someone by the name of “Paul Janosik” published circa 1980 in conjunction with The New Indicator. Do you have any record of that comic, by any chance, or know who Paul Janosik was? © 2019 new indicator | Tyrants' Foe, People's Friend!